2 Days. 3 Parties. 4 Toddlers. 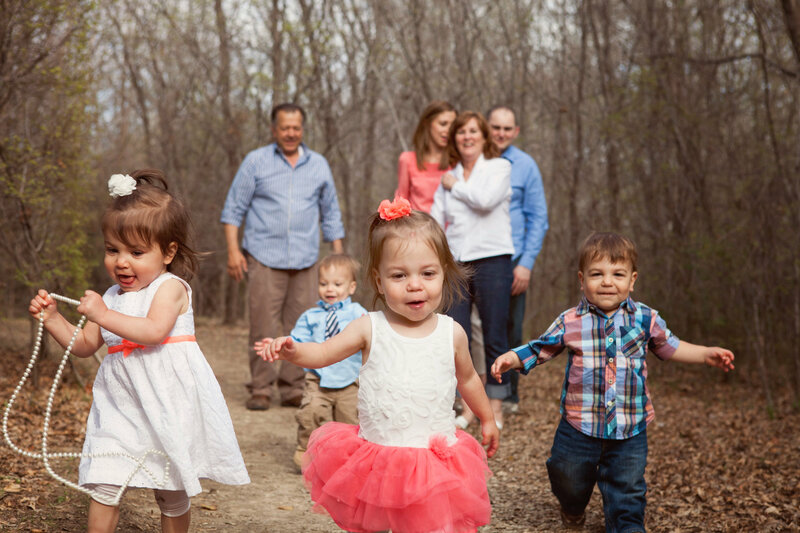 In just two days, we attended three parties with four toddlers. WHEW! I’m considering pitching this to the Olympic committee as a new sport. In order to take the quadlets out for an evening, we literally begin prepping after breakfast. As soon as I finish cleaning breakfast, I check to make sure the diaper bag is stocked, and we have plenty of toys and snacks. While the quads enjoy a morning catnap, George and I ferociously shower and get dressed. After their nap, the quads are fed lunch and dressed. As I get them ready, George is responsible for loading the quad mobile. Once everything is organized, we begin the loading process. I start with the back row because it’s easier for me to slip back there while George works on the middle row. It’s expected that after at least two are loaded, someone has a foul diaper that needs attention. Once we start the loading process, the van is usually rolling down the driveway within about 10 minutes, and we are sweating profusely. Are you exhausted yet??? This weekend turned out to be a rather busy one. 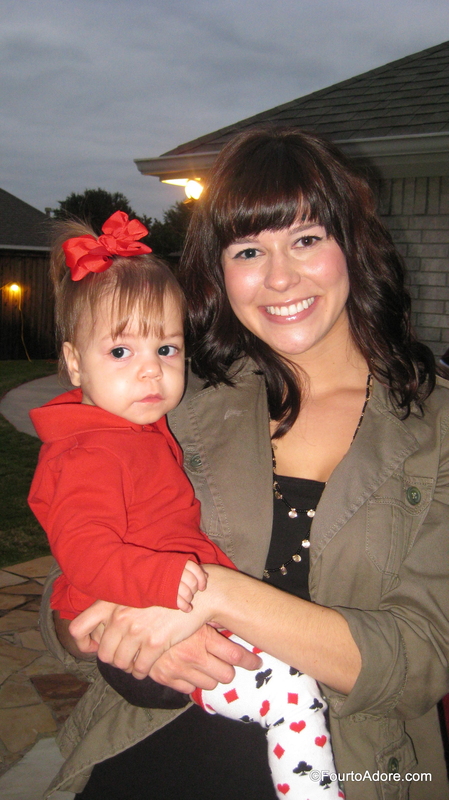 We were invited to a housewarming/ 30th birthday party and a shared children’s birthday party that began an hour later. Both of these parties were across town, but fortunately within close proximity to each other so we decided to make both. The next day, we had an early Thanksgiving dinner at my Grandmother’s house while my Aunt Susan visited from California. I don’t think we’ve hit three parties in a single weekend since college. 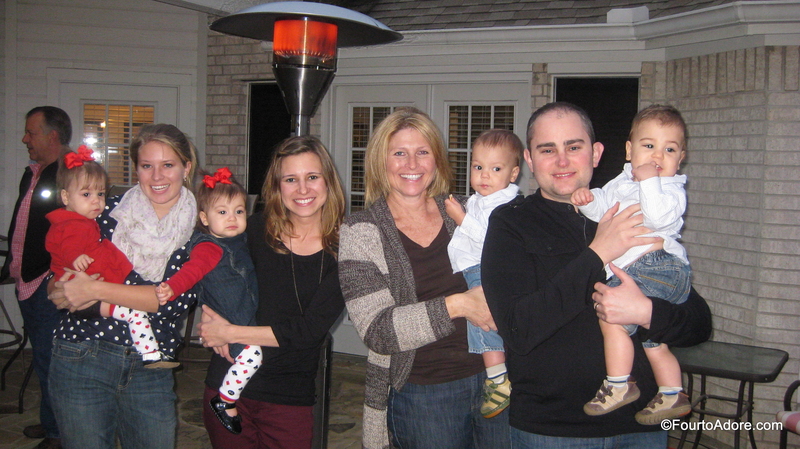 I was impressed that Aunt CiCi captured a picture with everyone looking (well, mostly) at the camera with eyes open! 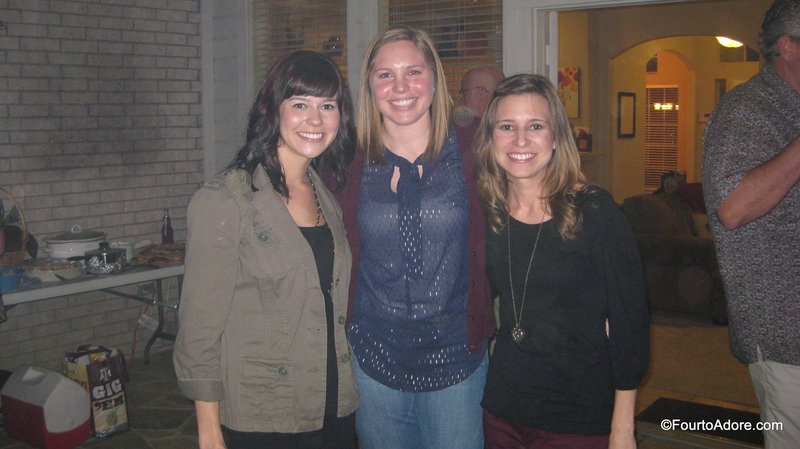 For once, I asked someone to take a picture, here I’m with my sister and Kaylie. I always feel a bit weird when I’m somewhere with the quads and I’m not holding or chasing one. I find myself doing head counts often. Terri loyally helps us care for the quads once a week while I go to work, and also when we have pediatrician appointments. She was so happy when they all gravitated towards her in a sea of unfamiliar faces. They know their caregivers! Harper became Ed’s little buddy, accompanying him everywhere. Whenever we go places with Nisey and Grandpa, Rylin seems to gravitate to Nisey who consoles her stranger danger. Somehow Rylin ended up greeting an unfamiliar guest AND she stayed with the guest for quite a while. When she spotted me, she gave the stink eye to her new-found friend. Sydney always needs a little snuggle time with her “Big Me”. After the quads soaked up all the attention they could at the first party, we loaded the quad mobile and followed our GPS to the next stop, my cousin, Jennifer’s house. There we were invited to celebrate the birthdays of her oldest two children. They always throw the best parties and I was so excited we were able to attend. They set up their backyard as a movie theater under the stars and screened Brave. Keeping up with the theme, hot dogs, popcorn, and candy were served. 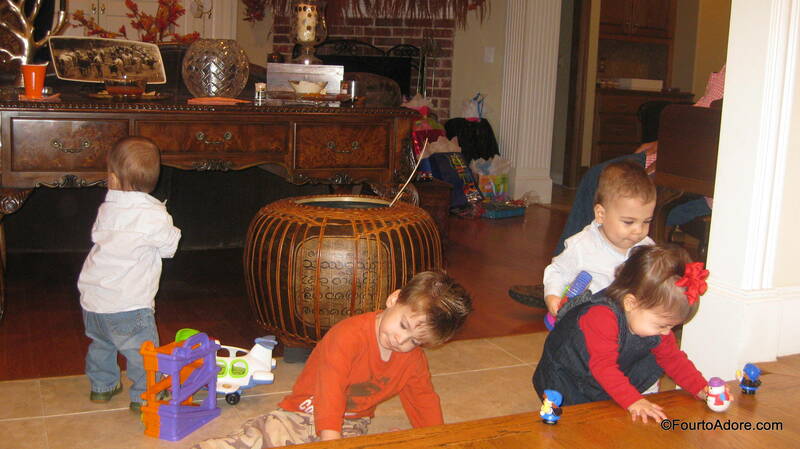 Jennifer’s youngest child jumped right in with the quads and generously shared his toys. 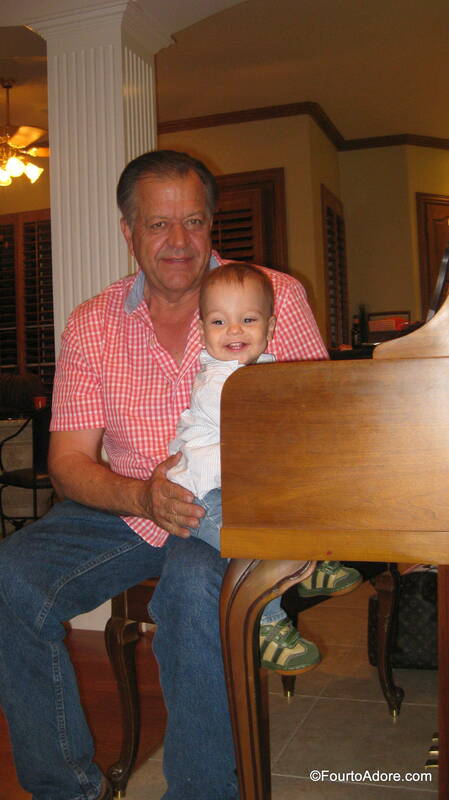 Mason showed Grandpa how to tickle the ivories. 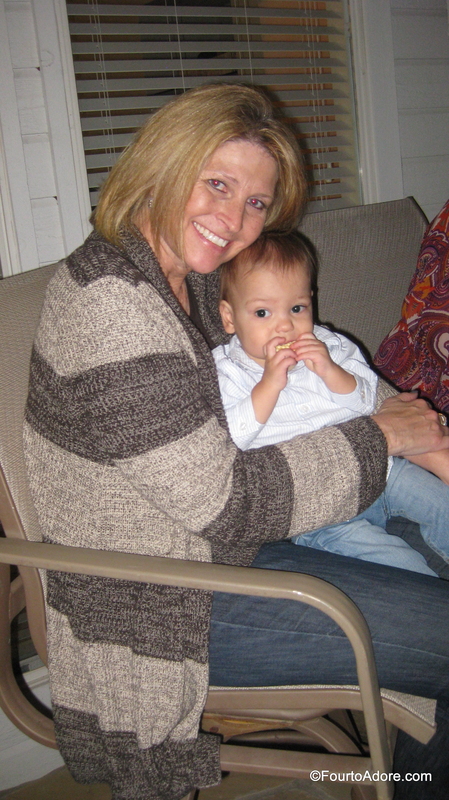 My cousin Lindsay and her cousin Julie got a little snuggle with Harper man. Sydney loved the long hallways in the house and trotted off independently. 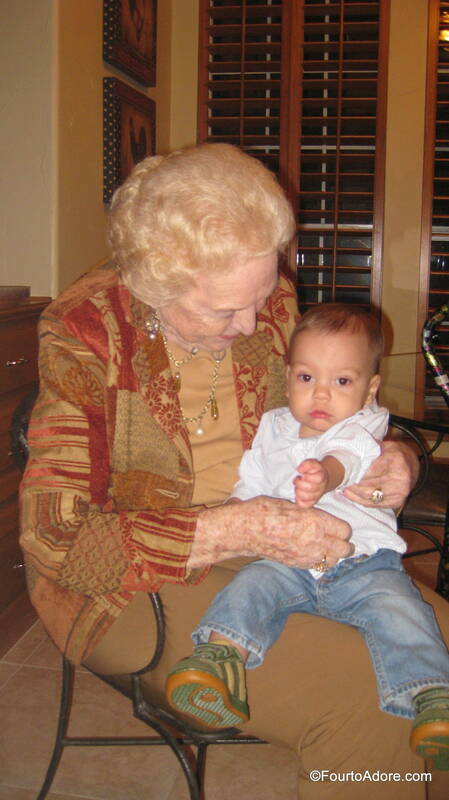 Mamaw absolutely adored the boys, especially when Mason crawled into her lap. 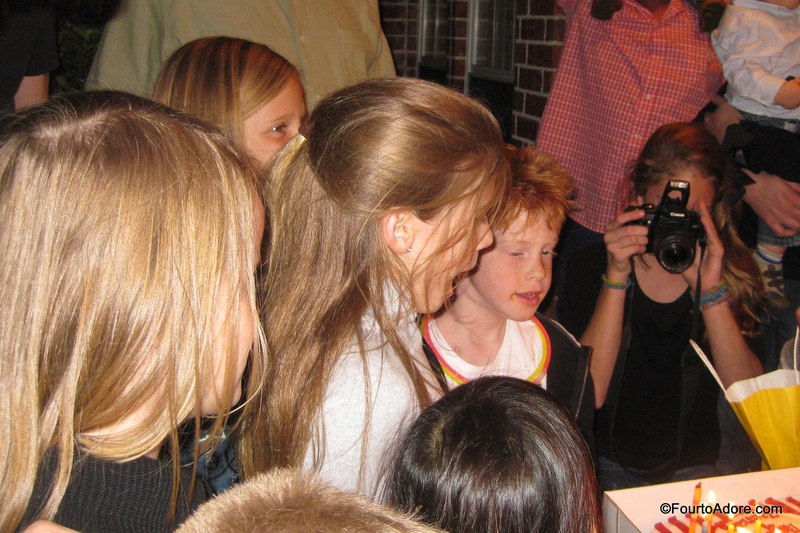 The quads enjoyed watching the birthday boy and girl blowing out candles. 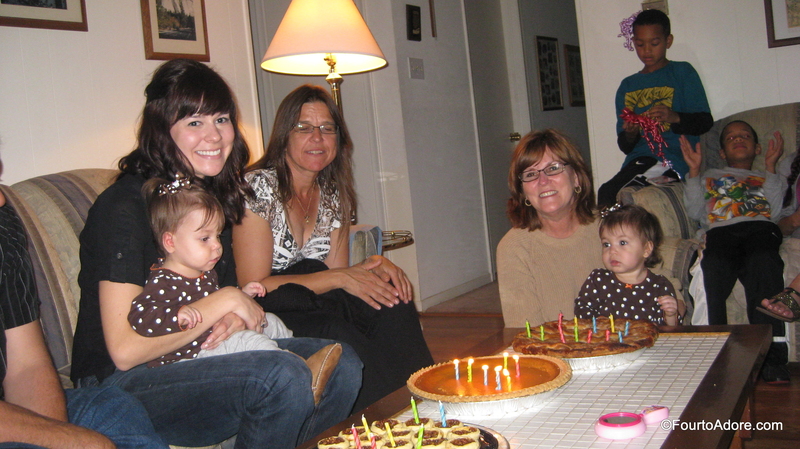 We rounded out the weekend with a traditional family Thanksgiving dinner/ family birthdays at Grandma’s house. After dinner, the quads had a chance to run freely in the front yard. They took turns noshing grass and chasing each other. 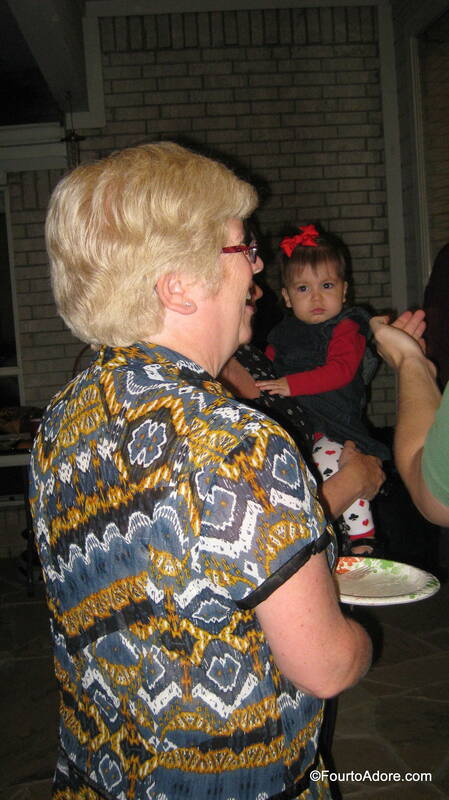 Sydney enjoyed being the center of attention and was fascinated with Cousin Rita’s braid. 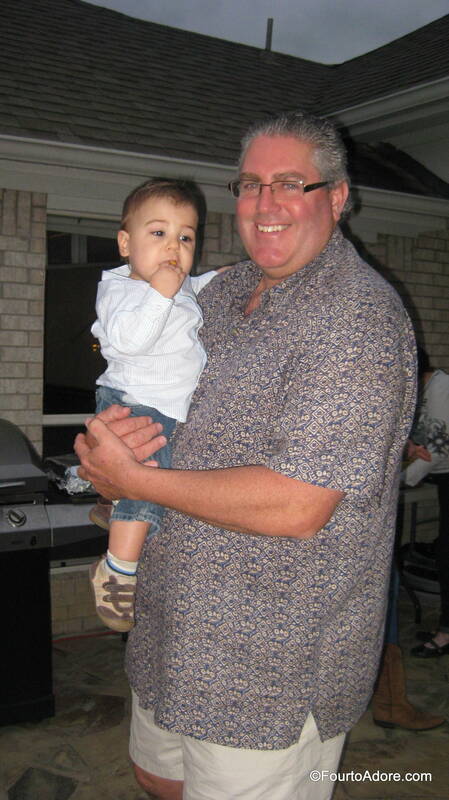 Mason always gravitates to the twins, especially Michael. When Rylin saw birthday candles she began saying “hot” and blowing. 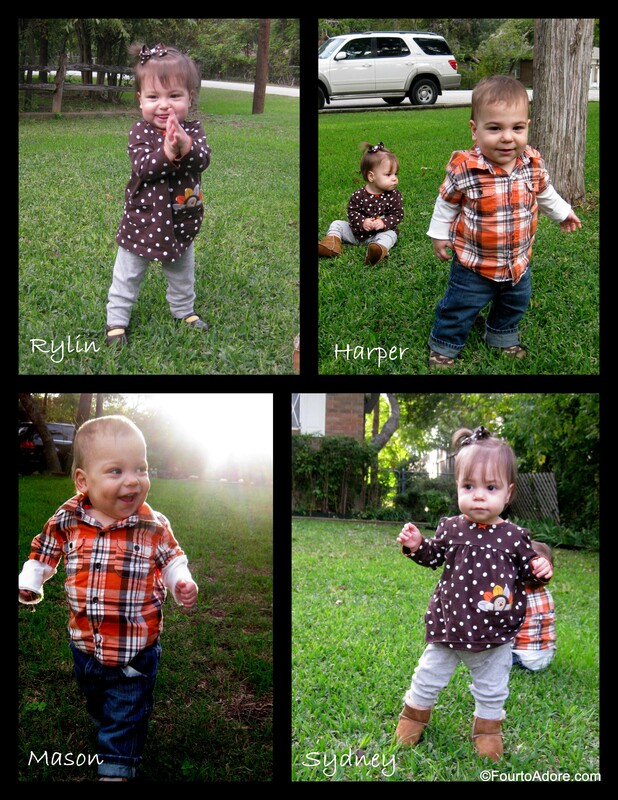 Nisey found Thanksgiving outfits for the girls, and the boy’s Halloween shirts coordinated perfectly with them. 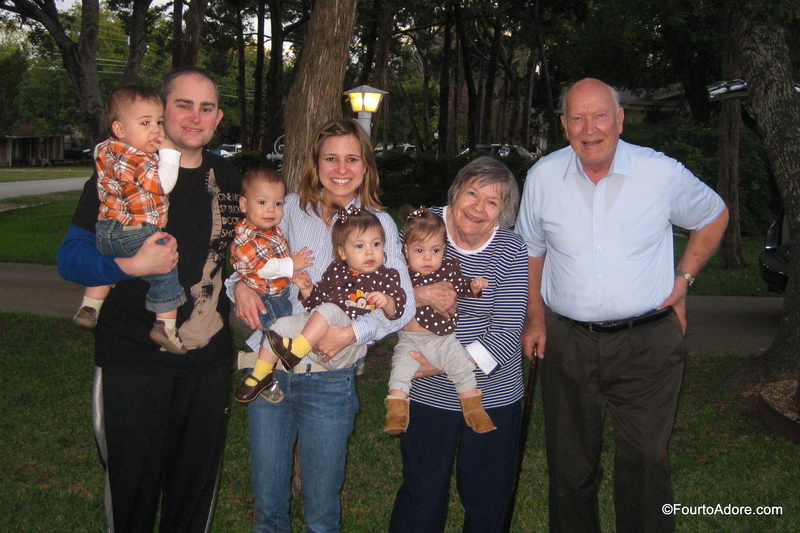 Our family with my grandparents. 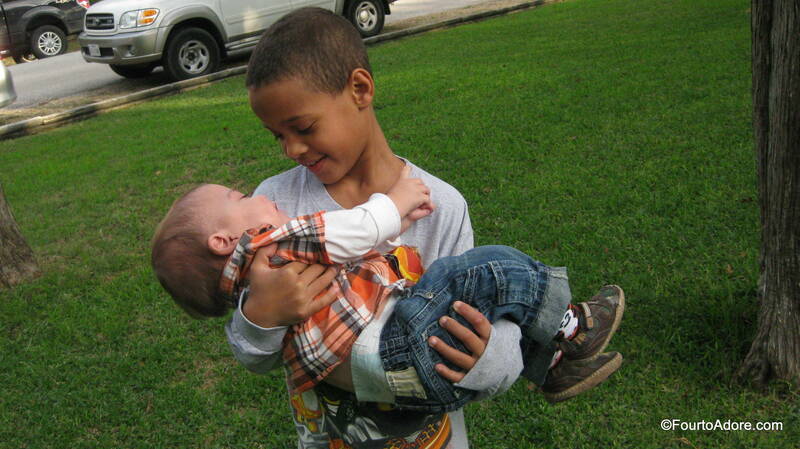 You both amaze me how well you handle the kids. They are absolutely adorable!! Awww, thank you :). I’m so happy we got to see you! Wow what a weekend. I never tire of seeing their pictures. So sweet. It’s so important to stay connected with family and friends P.K. (Post kids). I know it takes a lot of effort for your family but you will be glad you took the time to get out of the house. We loved having your clan at our place! That’s exactly the reason why we went to the effort of making all three parties. 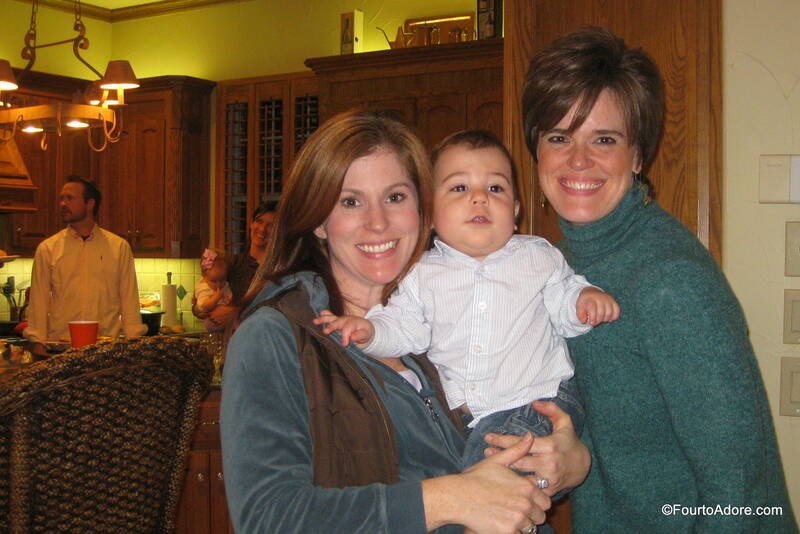 Our friends and family are precious to us, and we want the quads growing up to know these special people. Great job!!! We’ve done two parties in a weekend, but not three. I can only imagine how tired y’all are this morning! 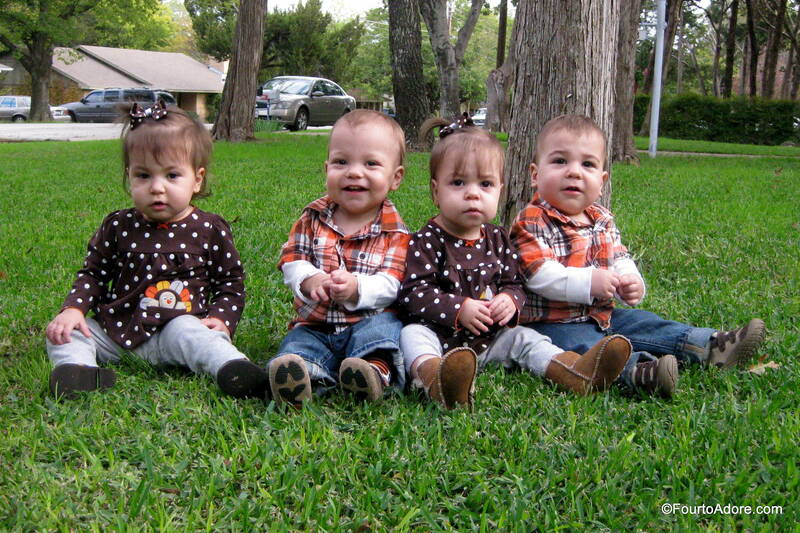 You look great in all the photos and I love the one of all four kiddos in their Turkey Day threads. Tired (more like exhausted), but I’m glad we saw everyone. It’s nice not being lockdown hermits, lol. We did have a lot of fun, and it was worthwhile despite the work. Ahh, yes I think I’ll take a long shower durning morning nap to unwind , lol.